To say slot are popular is like saying water is wet – it’s a huge understatement. Hands down, slots are the most-played game in the casinos. They’re just so FUN! There are as many reasons to play slots as there are people churning money into them; though, naturally, the biggest reason is the hope of winning money. The odds for winning at any one slot machine are fixed and unchangeable, and the house always has the edge. Depending on the computer program the casino used in the machine, the house edge can range from 1% to 17%, with the average between 5% and 15%. To put that into dollars, with a house edge of 15% you can expect to walk away with $85 for every $100 you bet. In other words, you will lose money over the long run even on the loosest slots. There is no strategy, no system, and no secret that can change this negative payout. But don’t give up yet. You can maximize your winnings and increase your fun at slots by following five simple tips. Never sit down at a slots machine without first setting a limit to your betting. That’s your bankroll for the day. Stick to it. Once it’s gone, you go. To help manage that bankroll, set firm limits to each bet. A good rule of thumb in setting betting limits is to calculate the cost of 250 bets relative to your bankroll. For instance, if your bankroll is $500, then you should bet no more than $2 on each pull. Always leave the slot machines with the money you’ve won. The only money you lose at the slots should be your bankroll. To walk away with your winnings, set them aside rather than bet them. Put them in a different pocket if you have to. This one small habit will increase the number of times you walk away from the slots with more money than you started with. What are you playing for: a profit, a jackpot, a good time, a free dinner? Unlike any other online casino game, slots are wonderful because of their variety – somewhere on the casino floor there’s a game that will fit your needs. Video slots with pick-ups give you more chances to win, but the jackpots are more elusive. Five-reel slots pay bigger jackpots but are less generous on the little wins. High payoff slots may not fit your bankroll and betting limit, but low payoff slots come with a higher house edge. Rather than sticking with the first machine you find, try a few, walk around, test them out, and find the machine that will give you the gameplay you want. What makes slots particularly challenging is that there is no way to calculate the odds or the house advantage on any machine absent long-term payout data. All of that information is locked away in the design and/or the software of the machine. As a general rule, however, the simpler the game play, the higher the odds. A three-line reel pays out better than a five-line reel. Also, higher denominations usually pay out better than lower denominations. For instance, if you don’t want to be more than 25 cents per pull, it is better to play a quarter in a 25-cent slot than five nickels in a nickel slot. The payout will be greater over the long run. Don’t let the better payouts encourage you to exceed your maximum bet though. The payout on a dollar machine might have better odds, but if one dollar is beyond your maximum, you’ll gain nothing by losing your bankroll faster. The house advantage means that over the long run every slot player will lose money except for the rare winners of jaw-dropping multi-million jackpots. The more you play, the more you lose. The problem is slots are designed to encourage players to play quickly. The slowest players pull 300 games an hour, while the pros clock in at over 800 games per hour. At these speeds, “lucky streaks” are almost certainly going to be wiped out by the law of averages. Take your time. 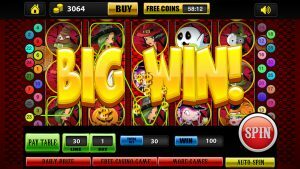 If you play 3 hours on an an 85% payout machine (around 1500 games), it is nearly impossible for you to walk away with less than a 15% loss unless you hit the one-in-a-million jackpot. Slowing down the game play allows you to take greater advantage of a streak of good luck and leave the table with money in your pocket. Casinos do not make money on slots because players are unlucky. They make money on slots because, in the long run, all players average out. Even phenomenally lucky players become average players after enough games. That is the definition of house advantage. For that reason, the casinos want you to play so many games that your winnings revert to the average. If your luck is above average, be smart and walk away. The smartest way to walk away with your slots winnings is to set a limit on your winnings. If you hit that limit, and walk away with your money. No exceptions. No ‘just a couple more.’ Walk away. If you combine this with the other four tips, you have now beaten the best online casinos at their own game!